Whimzees Toothbrush Dog Chews are made out of all-natural compounded vegetable fibres that help to promote healthy teeth and gums. Completely edible and free from gluten, sugar and artificial ingredients, each toothbrush shaped chew has a unique vegetable based texture that helps to remove plaque and tartar from your pet’s teeth as they chew. 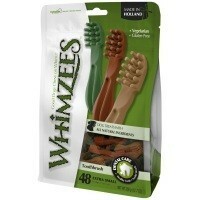 Whimzees Toothbrushes also contain malt extract and yeast that helps to improve metabolism and muscle tone, while promoting strong bones and a healthy, shiny coat. The chews come in a resealable value bag with a velcro fastening to keep your dog's treats fresher for longer. Please note that the colour may vary between green, brown and tan which cannot be guaranteed when ordering. I was recommended these by my vet for my dog with allergies. I have now been using them for 10 years and am very pleased with them.